After a few days in Melbourne, we set out to explore the surrounding areas in the state of Victoria. 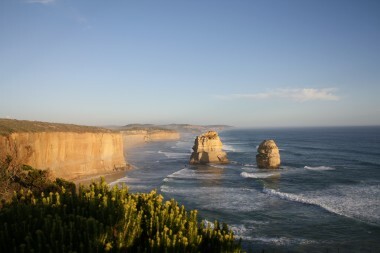 Top on our list was a drive down the Great Ocean Road. This 100 mile stretch along the southern coast of Australia is said to offer some of the most spectacular coastal scenery imaginable. We set out to put it to the test. The famous road begins just an hour outside of Melbourne from the surfing capital Torquay and runs west, hugging the coast along the Tasman Sea. We rented a car to spend a day making the drive and the views were spectacular. We passed Bells Beach, made famous in the 90’s movie “Point Break” and stopped by the Arie Inlet lighthouse to take in the views. We followed the mountainous roads as they snaked through the hillside past charming coastal towns. We walked through the nearby eucalyptus forests lined with koala bears and kept our eyes peeled (to no avail) for the many kangaroos said to be hopping around along the way. 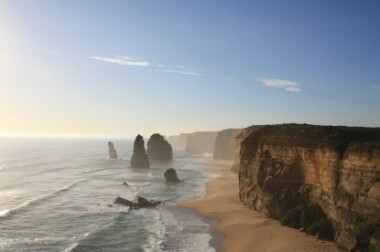 The culmination of the journey, and highlight of our day, was a view of the rock formations known as the 12 Apostles. Here erosion on the towering cliffs created 12 giant rocks that jet out from the sea. We made it here in time for sunset and watching the sun light fall against the rocks as the waves crashed against them, was an incredible sight. 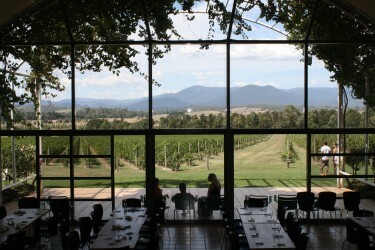 Next on our agenda was a visit to the Yarra Valley wine region. Known for its white wines and Pinot Noirs, we spent an afternoon sipping our way around the pastoral valley. We stopped at the cellar door of the Yering winery to taste their offerings and then made our way to Moet & Chandon. The famed, France champagne maker had set up shop in the Australian Yarra valley and didn’t leave home without it’s haughty, French charm. In true French fashion, the vineyard paid homage to fine wine and food, with a delectable French-inspired menu and elegant setting. We enjoyed a platter of charcuterie and washed it down with some champagne tastings. When it comes to beautiful wine regions, this place really doesn’t compete. It’s a bit brown and dry, and lacking a bit of the charm some of the other wine regions I’ve had a chance to explore. Nonetheless, the Yarra Valley makes a great day trip for those looking for an afternoon in the countryside outside of the hustle and bustle of Melbourne. looking forward to doing this trip myself soon!